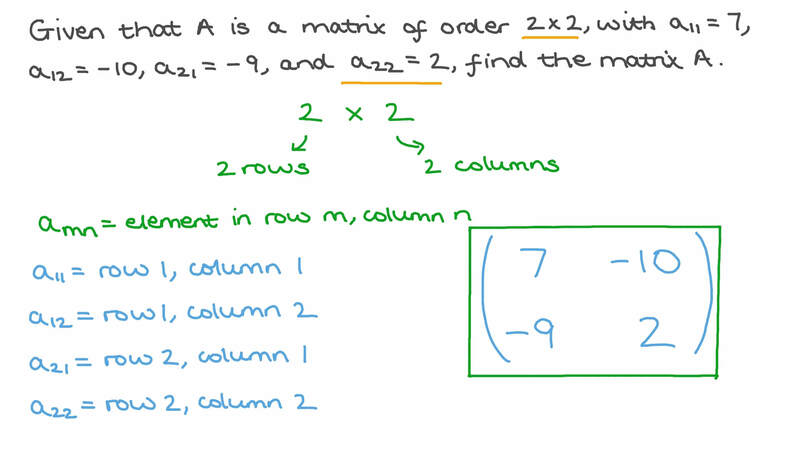 In this lesson, we will learn how to find an element in a matrix given its row and column numbers. Given that find 𝑎 2 3 , 𝑏 2 1 , and 𝑐 2 1 . Given that 𝐴 is a matrix of order 2 × 2 , with 𝑎 = 7 1 1 , 𝑎 = − 1 0 1 2 , 𝑎 = − 9 2 1 , and 𝑎 = 2 2 2 , find the matrix 𝐴 . Given that 𝐴 is a matrix of order 3 × 2 , where 𝑎 = 0 1 1 , 𝑎 = 𝑎 − 3 1 2 3 1 , 𝑎 = 4 2 1 , 𝑎 = 1 2 𝑎 2 2 1 1 , 𝑎 = 8 3 1 , and 𝑎 = 1 4 𝑎 3 2 2 1 , determine 𝐴 . Given which are the negative entries of ? 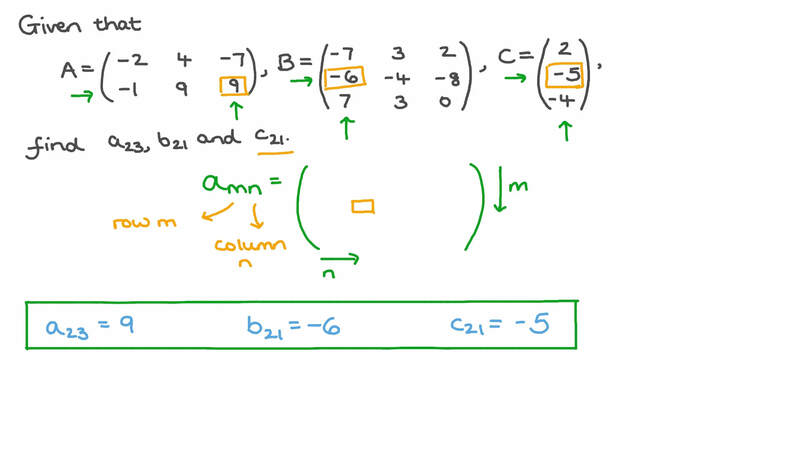 Consider the matrices 𝐴 and 𝐵 . Determine 𝑎 1 2 and 𝑏 1 1 .